cc @matthid - have you ever seen this sort of error? Another question I have regarding this, is how do I just disable the build of the docs during a full or all build anyway? Can I just take it out of some file or such? Just not sure how to surgically remove it at this point. Yes I have seen this error, and actually this was one of the reasons for the workaround removed with 87c1284 (especially (getItem "FSharp.Core").Replace("4.3.0.0", "4.3.1.0")). Do you use an older mono version? Can you try to update mono or add this workaround if you need to be compatible? @tpetricek @matthid I'll give your suggestions a try and play around with the docs gen in the build and out of the build. @matthid - I should have the latest version of mono, but will check again to insure that I do. I'll get a list of the exact version I have and post it for reference. Ok, I gave both suggestions a try. I did have the latest mono installed @matthid. I also tried the generate.fsx that @tpetricek suggested. That worked by just removing it, but it wasn't ideal since I'd like to have everything just working right. So here is were things got kind of interesting. I put everything back the way it was in the generate.fsx file and did a build. It broke, as I'd suspect with the error above. Then, by happenstance I noticed I needed to upgrade a number of things on Ubuntu 14.04 itself. So I clicked install and started downloading some 600+ MB of patches and updates. That finished, I had to reboot and the fs couldn't be mounted. So I went through a reboot, came into safe mode and let Ubuntu run a package rebuild for everything installed on the operating system. When that finished, I booted back up normally and launched Visual Studio Code and the bash to get back to work resolving this issue. That's when I did a build and everything passed perfectly. Moral of the story, it appears that Ubuntu 14.04 needs the latest patches as well as insuring the latest mono is installed. It seems there must have been some mono dependency that was necessary for docs generation. So, I'm going to mark this as closed, and self-post a solution to Stack Overflow. I REALLY appreciate the help from both of you, cheers! Huh, that sounds pretty mysterious. Oh well, computers :-). Glad you got it to work in the end! So far, I have not able to get this fixed. I know fsharpi and Monodvelop's latest version is installed on my system, so I'm at a loss as to what to do. @jacqueline-homan Do you have a more detailed log for the first error you were getting? System.IO.DirectoryNotFoundException: Directory '/home/jacqueline/Documents/bashrc' not found. When I was researching to try to find the solution for fixing it, I came across this thread and followed what @Adron did, but then got the error I got in my screencap above. 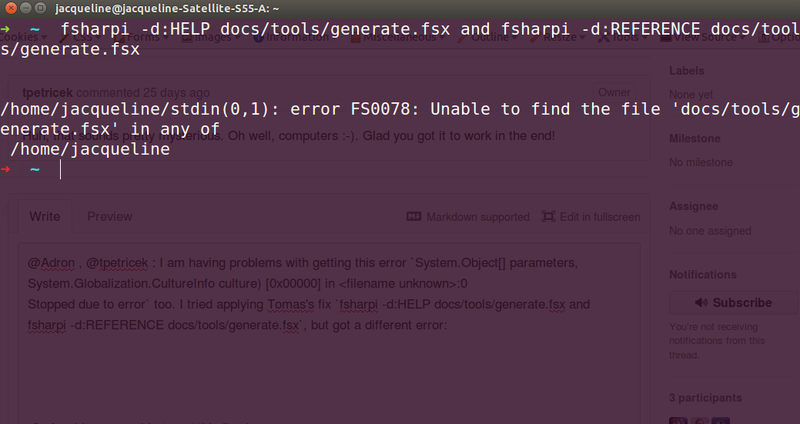 I ran the command locate docs/tools/generate.fsx in my terminal and no results came back. So that means it's not anywhere in my machine. Closing due to inactivity and because the initial issue was solved as far as I can see. Please open a new one if this is still a problem.